Out now: Mobile Learning. Structures, Concepts and Practices of the British and German Mobile Learning Discussion from a Media Education Perspective. Since August 15th, 2014 my paper “Mobile Learning. Structures, Concepts and Practices of the British and German Mobile Learning Discussion from a Media Education Perspective” is available online. It is part of the proceedings of the Educational Media Ecologies: International Perspectives Conference (2012 at the University of Paderborn; see my talk here) edited by Dorothee M. Meister, Theo Hug, and Norm Friesen. The paper is the English translation of a text published in German about one year ago (and: a very short and compressed version of my Phd thesis). Focus is Mobile Learning as a scientific field of media education; a view to related disciplines, arguments and concepts; and a short discussion of challenges deriving from the practical implementation of mobile learning in school contexts. As a scientific field within media education and educational sciences the research on and the practical implementation of mobile learning is evolving. 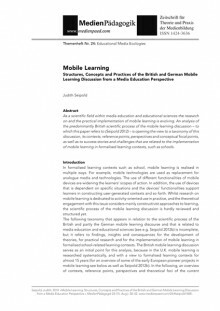 An analysis of the predominantly British scientific process of the mobile learning discussion – to which this paper refers to (Seipold 2012) – is opening the view to a taxonomy of this discussion, its contexts, reference points, perspectives and conceptual focal points, as well as to success stories and challenges that are related to the implementation of mobile learning in formalised learning contexts, such as schools. 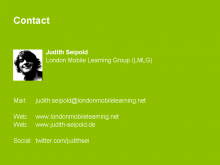 Seipold, Judith (2014): Mobile Learning. Structures, Concepts and Practices of the British and German Mobile Learning Discussion from a Media Education Perspective. In: MedienPädagogik, Nr. 24, S. 30-52. Online. Mobile Learning. Potential and controversy embodied in a young scientific field, and arising consequences for future research and practice. On March 27 and 28, 2012 the conference “Educational Media Ecologies – International Perspectives” took place at the University of Paderborn (Germany). As I was not able to attend in person I submitted a video presentation that can be watched on YouTube or below. The slides can be accessed via the slideshare website, the abstract is available below as well as on the conference website.